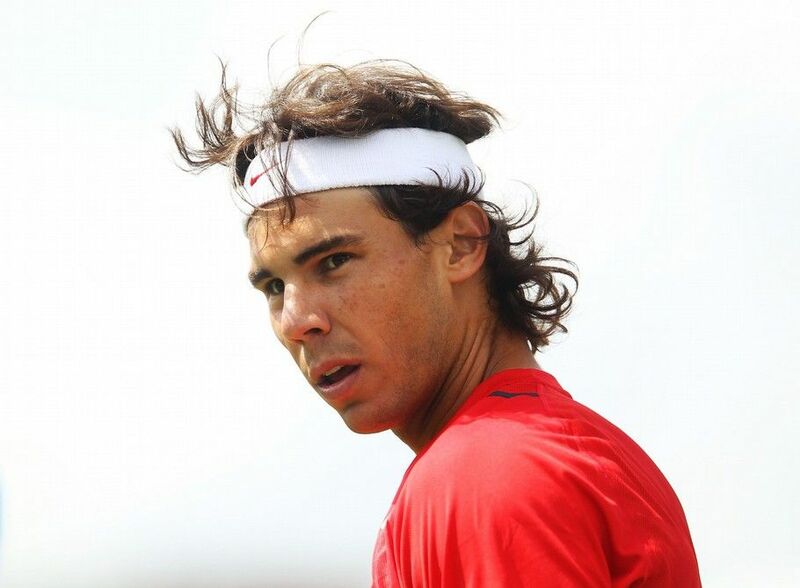 Rafael Nadal , the No. 1-ranked tennis player in the world, tells us how he balances his life on and off the court and his children's health foundation. Rafa Nadal Covers the new issue of WebMd Magazine, he's interviewed here on his healthy lifestyle. Rafa is an inspiration to us all! Even Health Magazines like WEBMD take an interest into Rafa Nadal for an interview! There isn't anything that I havn't heard in this article but I really like the fact that WEBMD has taken an interest to interview our Champion! The No. 1 world tennis champ talks about his childhood, his training, his diet, and the sacrifices he has made for his sport. Rafael Nadal does not remember the first time he held a tennis racquet. He was too young -- 3 years old, maybe 4. But that racquet must have felt just right in his small hands. By age 5, he was a regular at the local tennis club in his hometown of Manaco, on the Spanish island of Mallorca. Winning titles came almost as early. When he was 8 years old, he won a regional championship for players under 12, defeating boys who were three years older. By the time he turned 12, he had won both Spanish and European titles in his age group. Four years later, he was listed among the world's top 50 tennis players. In August 2008, at age 22, he was No. 1. All told, Nadal has won nine Grand Slam titles. The number may be 10 by the time you read this. He was expected to win the French Open last month, after our press date. "His greatest achievements are those Grand Slams, winning the Davis Cup with the Spanish team, and winning the gold medal in the 2008 Olympics," says former tennis world champion Mats Wilander. "Overall, he's the best right now, and if he keeps playing as well as he does now, in four or five years he's going to be considered the greatest player of all time." What makes him such an unstoppable opponent, says Wilander, is his ability to know his opponent's game as well as he knows his own, and to use that knowledge against him. "If his opponent can't run, Nadal makes him run. He picks his game apart, he picks him apart," Wilander says. "And he has learned to hit balls where you least want him to. That might be behind you, to your left, your right, short, long -- always, he's catching you off guard." Wilander cites Nadal's eagerness to keep learning the game as another factor in his phenomenal success. "He keeps changing his game even though he's No. 1 in the world." And then, of course, there's the way that he hits the ball. "He puts twice the amount of spin on the ball than any other player," says Wilander. "That's why he is so dominant." As if playing tennis were not enough, Nadal has a book coming out in late August, an autobiography titled Rafa: My Story. While his memories of his earliest tennis days are hazy, he does recall the excitement and nervousness he felt at his first competition. In all the years since, Nadal says, that is one thing that hasn't changed. "It is still exciting and I still get nervous these days!" Nadal says. It's not surprising that Nadal took to sports at such a young age. From the day he was born, he was surrounded by professional athletes, including two uncles: Miguel Ángel Nadal, a former soccer player, and Toni Nadal, a retired tennis pro. "I was very much in the world of sports through my family," Nadal says. "I loved soccer and tennis and knew a lot from both sports, thanks to my father and uncles." It was Toni who introduced his nephew to tennis, and he has been Nadal's coach and mentor ever since the young prodigy took his first steps onto the court. "My Uncle Toni loved the sport of tennis, and he is the one who showed me about the sport and transmitted to me that passion for the game and the respect," Nadal says. "My uncle was always with me, and he supported me and motivated me. My father came to a lot of my matches as well." But most of his motivation came from within. Nadal says that he frequently -- and willingly -- sacrificed time with friends, missing parties and giving up his weekends in favor of tennis. "Yes, sure, I did make some sacrifices that we all know you have to make, but still I love to play tennis, I love the competition, I have passion for the sport, and that compensates," Nadal says. "I did what I liked, so no real sacrifices." One sacrifice tennis did require Nadal to make was giving up soccer (or "football," as it's known outside of the U.S.). As a kid, he was a very promising player, but for him to excel at one sport and to leave time for school, his father told him he had to choose. "I was always playing sports, always running around with a football to play soccer or with a tennis racquet. Sports has always been everything for me. I love it and always did," says Nadal. "At some point I had to choose between soccer or tennis since I was also at school and there are not enough hours during the day to do everything I wanted to do. So, at the age of 11, I had to focus on my school and my tennis career and leave soccer aside." "I think I made the right decision looking at how things went for me with tennis," he says. It's hard to argue with that. He still loves soccer, and he roots for his two favorite teams, Real Madrid and Real Mallorca, but he is cautious about the time he spends on the field. And he sometimes passes on occasions such as playing in charity events to reduce the chances he might be injured. He's far from immune to injury. In fact, anyone familiar with his aggressive playing style might wonder whether he courts it. To say that professional tennis is a rigorous, physically demanding sport is an understatement. And it has taken its toll on Nadal. He's suffered from tendinitis in both knees. A stress fracture in his left foot kept him out of competition for months in 2004. For two years, injuries have upset his chances at the Australian Open: In 2010, he was sidelined by a knee injury, while this past January, the blame fell on an injured hamstring, which required 10 days of physical therapy and anti-inflammatory treatments before he was ready to play again. "His heart is too hungry to let his body get in the way," Wilander says. "Sometimes he oversteps his boundaries. Will he last 10 more years? I have no idea." But what hurts him more than his injuries, Nadal says, is being forced to sit on the sidelines. "I had a foot injury when I was supposed to play Roland Garros," Nadal recalls of the 2004 Grand Slam tournament commonly known as the French Open. "At some point a doctor told me I was maybe not going to be able to play tennis again on a professional level. I was watching tennis on TV at home and started to cry thinking about the words of the doctor. This is the worst, not to be able to compete." Needless to say, Nadal made a full recovery. "Everything went well, and here I am playing tennis," he says. That, too, is an understatement. He won the next four French Opens. Nadal's body has certainly felt the hardships of the game. Mentally, though, he says he is totally at ease with its demands. "I don't think it is stressful. We have tension at some point, but in the end it is only a game," he insists. He takes an equally laid-back approach to his downtime. For him, a satisfying night off involves staying in his room and watching movies or playing video games. Otherwise, he's out with friends at one of his favorite Japanese or Italian restaurants, wherever he can get good seafood. "But, of course, Spanish food I think is the best." He says he makes sure to eat the right things before a match or in the days leading up to a match. Simple foods are what he prefers, such as grilled fish served with pasta and vegetables. But he's not without his guilty pleasures. "Chocolate! Nutella! French fries," Nadal says, listing some of his favorites before adding, "But I eat them when I am not close to a match and never abuse any of those." Not all of his free time is spent on fun. In 2008, he officially launched the Rafa Nadal Foundation (www.fundacionrafanadal.com), a nonprofit dedicated to creating opportunities for disabled children, as well as those who are underprivileged. In October 2010, the foundation celebrated the opening of a school in the Anantapur district in southeast India, in collaboration with the Vicente Ferrer Foundation, an India-based nonprofit focused on improving living conditions among the poorest and most marginalized people in the region. The aim of the school is to provide its 150 students -- from some of the most impoverished parts of India -- with an education, health care, nutrition, and, of course, sports, with a focus on one sport in particular. At the opening ceremony, Nadal spent time on the school's courts, giving the new students their first tennis lesson. "I always wanted to do things for others, and I wanted to start already something that I could also be doing in the future," says Nadal. "Right now I don't have much time, but I have also my mother and some people working with me. I give some time now but will dedicate more in the future." For now, though, tennis is the thing. "I love to be in a match and see that I can play at my best," Nadal says. "I love to compete, to win, to be there, to feel the support from the crowds." There may be only one Rafael Nadal, but there's no shortage of intensely driven young athletes eager to enter the ranks of the elite. But no matter the sport -- tennis, swimming, football, gymnastics -- it will take a toll on a child's body and mind. Laurel Blakemore, MD, chief of orthopaedic surgery and sports medicine at Children's National Medical Center in Washington, D.C., offers a few tips to keep kids off the injured list and at the top of their game. Play the field. Even if your child is focused on being the best at one sport, his body will benefit from branching out from time to time and giving other muscle groups a workout. "It's physically difficult to always play a single sport," says Blakemore. "Cross-training doesn't put the same amount of stress on the body. And mentally, it's good to mix things up. There's less burnout that way. "If your kid is into soccer, suggest a season of track or basketball. Keep it light. Muscles don't really start building until well into puberty. Until then, no amount of heavy lifting will help them grow any faster. Instead, it may cause injuries, particularly to growth plates, sensitive areas of tissue that determine the final length and shape of growing bones. Best to start with low weights and increase gradually, lifting on two or three nonconsecutive days during the week, says Blakemore, who also advises focusing on form and technique and not lifting to exhaustion. Use "low weights and frequent repetitions," Blakemore advises. Take a break. This is easier said than done. "If a child is really talented and driven, he or she will be really motivated to keep going. "But all too often, a young athlete who doesn't choose to take time off ends up forced to take time off by injury. "When kids come in, it's often from overuse injuries like stress fractures, aches and pains, and repetitive motion injuries," says Blakemore. "Tennis elbow is a perfect example." She also cites distance running and gymnastics as sports that often cause overuse injuries. Check your head. According to Blakemore, sports psychologists are playing a bigger role with young elite athletes. That's a good thing. Not only can they help athletes improve their performance, but they can also help athletes cope with performance anxiety and aid injured athletes returning to the game. "Psychologically, young athletes can have real trouble getting back to their previous level of performance after an injury," says Blakemore. "It's often hard to go out and believe they can do it."